"Thirty years ago, it would have been inconceivable to have imagined a ban on smoking in the workplace or in pubs, and yet that is what we have now. Are we willing to be just as courageous in respect of obesity? I would suggest that we should be," said the leader of the UK's children's doctors. McDonald's currently sponsors the youth coaching scheme run by the Football Association. Leading doctors today weigh in on the debate over the government's role in promoting public health by demanding that ministers impose "fat taxes" on unhealthy food and introduce cigarette-style warnings to children about the dangers of a poor diet. The demands follow comments last week by the health secretary, Andrew Lansley, who insisted the government could not force people to make healthy choices and promised to free businesses from public health regulations. 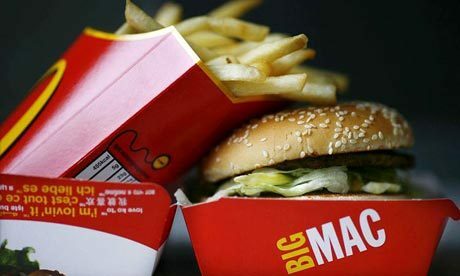 But senior medical figures want to stop fast-food outlets opening near schools, restrict advertising of products high in fat, salt or sugar, and limit sponsorship of sports events by fast-food producers such as McDonald's. They argue that government action is necessary to curb Britain's addiction to unhealthy food and help halt spiralling rates of obesity, diabetes and heart disease. Professor Terence Stephenson, president of the Royal College of Paediatrics and Child Health, said that the consumption of unhealthy food should be seen to be just as damaging as smoking or binge drinking. Lansley has alarmed health campaigners by suggesting he wants industry rather than government to take the lead. He said that manufacturers of crisps and confectionery could play a central role in the Change4Life campaign, the centrepiece of government efforts to boost healthy eating and fitness. He has also criticised the celebrity chef Jamie Oliver's high-profile attempt to improve school lunches in England as an example of how "lecturing" people was not the best way to change their behaviour. Stephenson suggested potential restrictions could include banning TV advertisements for foods high in fat, salt or sugar before the 9pm watershed and limiting them on billboards or in cinemas. "If we were really bold, we might even begin to think of high-calorie fast food in the same way as cigarettes – by setting stringent limits on advertising, product placement and sponsorship of sports events," he said. Such a move could affect firms such as McDonald's, which sponsors the youth coaching scheme run by the Football Association. Fast-food chains should also stop offering "inducements" such as toys, cuddly animals and mobile phone credit to lure young customers, Stephenson said. Professor Dinesh Bhugra, president of the Royal College of Psychiatrists, said: "Some types of processed foods are harmful to the physical, and consequently mental, health of individuals. There ought to be serious consideration given to banning advertising of certain foods and certain processed foods and to levying tax on fatty, unhealthy foods, which would be ring-fenced for the NHS, which deals with the consequences of fatty foods." School pupils need to be told more about the effects of bad diet, said Bhugra: "If children are taught about the impact that food has on their growth, and that some things can harm, at least information is available up front." He also urged councils to impose "fast-food-free zones" around schools and hospitals – areas within which takeaways cannot open. Stephenson and Professor Steve Field, chairman of the Royal College of General Practitioners, said that Lansley was right to stress the importance of personal responsibility, as well as government action, in ending the country's dysfunctional relationship with food. Both strongly criticised parents for setting their children a bad example by overeating, serving poor quality food and exercising too little. "Parents are role models for their children. It's crucial that they set the tone for what the children eat and their physical activity," said Stephenson. "The fact that one third of our children are now overweight … must mean that their parents are allowing them to eat excessive amounts of food." Parents should exercise "portion control" in the amount they eat, and limit the amount of fast food and ready meals they feed their children, he added. Field, a GP in Birmingham, said: "Too many parents show too little responsibility in passing on good eating and drinking habits to their children." A Department of Health spokesperson said: "We need to create a new vision for public health where all of society works together to get healthy and live longer. This includes creating a new 'responsibility deal' with business, built on social responsibility, not state regulation. Later this year, we will publish a white paper setting out exactly how we will achieve this." The food industry will be alarmed that such senior doctors back such radical moves, especially the call to use some of the tough tactics that have been deployed against smoking over the last decade. Last month the National Institute for Health and Clinical Excellence recommended a host of measures to make food healthier to reduce strokes and heart attacks, and save an estimated 40,000 lives a year. But the department of health dismissed its proposals as unrealistic.